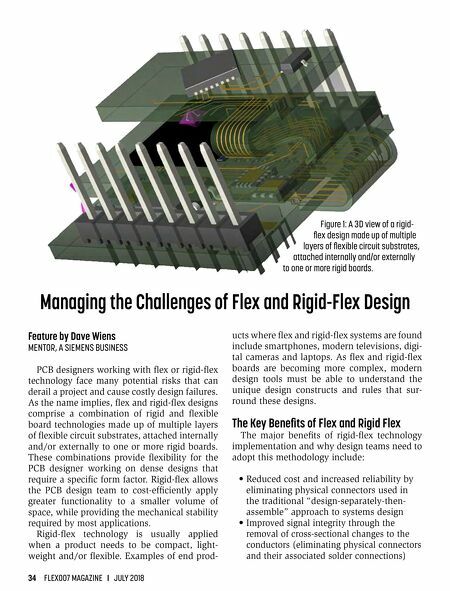 34 FLEX007 MAGAZINE I JULY 2018 Feature by Dave Wiens MENTOR, A SIEMENS BUSINESS PCB designers working with flex or rigid-flex technology face many potential risks that can derail a project and cause costly design failures. 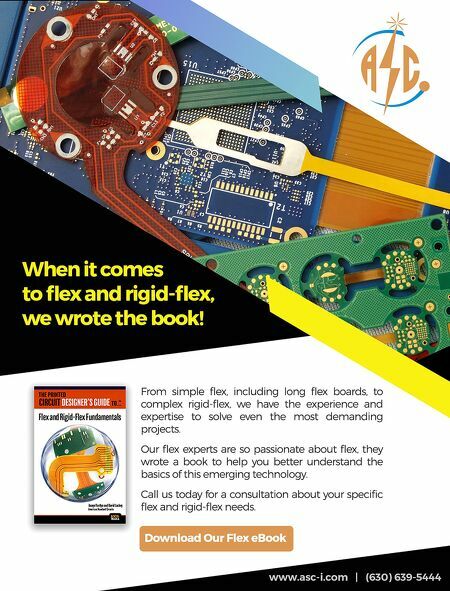 As the name implies, flex and rigid-flex designs comprise a combination of rigid and flexible board technologies made up of multiple layers of flexible circuit substrates, attached internally and/or externally to one or more rigid boards. These combinations provide flexibility for the PCB designer working on dense designs that require a specific form factor. Rigid-flex allows the PCB design team to cost-efficiently apply greater functionality to a smaller volume of space, while providing the mechanical stability required by most applications. Rigid-flex technology is usually applied when a product needs to be compact, light- weight and/or flexible. Examples of end prod- ucts where flex and rigid-flex systems are found include smartphones, modern televisions, digi- tal cameras and laptops. As flex and rigid-flex boards are becoming more complex, modern design tools must be able to understand the unique design constructs and rules that sur- round these designs. The Key Benefits of Flex and Rigid Flex The major benefits of rigid-flex technology implementation and why design teams need to adopt this methodology include: • Reduced cost and increased reliability by eliminating physical connectors used in the traditional "design-separately-then- assemble" approach to systems design • Improved signal integrity through the removal of cross-sectional changes to the conductors (eliminating physical connectors and their associated solder connections) Managing the Challenges of Flex and Rigid-Flex Design Figure 1: A 3D view of a rigid- flex design made up of multiple layers of flexible circuit substrates, attached internally and/or externally to one or more rigid boards.